A $5 million fund from Hartford-based Travelers Cos. will assist Connecticut customers whose homes exhibit concrete deterioration associated with expansion attributed to pyrrhotite, an iron sulfide-bearing compound identified in aggregate from a Willington, Conn. quarry. The voluntary Travelers Benefit Program offers up to $25,000 and $10,000, respectively, to current and past policyholders whose repair costs exceed awards from the recently launched Connecticut Foundations Solutions Indemnity Company (CFSIC). The state will fund CFSIC at up to $20 million annually through 2022, with individual homeowner awards likely capped at $175,000. The captive insurance program and Travelers Benefit have emerged from state agency investigations, beginning in 2015, on failing residential concrete foundations in more than 35 northeast Connecticut communities. All foundations appear to have been supplied by J.J. Mottes Co., a former ready mixed producer sourcing aggregate from a sister operation, Becker’s Quarry, whose reserves are part of a pyrrohotite-laden deposit. Deterioration has been observed on concrete delivered from 1983–2010. The Connecticut Department of Consumer Protection is among agencies probing widespread residential foundation failure. It enlisted University of Connecticut Associate Professor Kay Wille, who after an eight-month investigation of foundation concrete and Becker’s Quarry samples, offered a theory on pyrrhotite in a portland cement-bound matrix: The compound oxidizes when exposed to water plus oxygen or ferric ions, spurring formation of an expansive mineral product such as ferihydrite plus release of sulfates. The latter react with aluminum-bearing portland cement phases, resulting in the formation of expansive and deleterious minerals such as ettringite. Carbon from aggregates’ calcite or environmental carbon dioxide can form another deleterious compound, thaumasite. 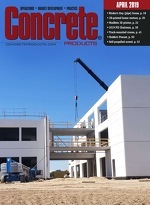 The U.S. Attorney’s Office for the Eastern District of Virginia obtained a $700,567 judgment against Andrew Nolan, a former quality control manager for Pennsylvania-based Universal Concrete Products Corp. The fine follows an August 2018 agreement in which he pleaded guilty to conspiring to commit wire fraud by falsifying air content test results on the federally funded Dulles Metrorail Project in northern Virginia. Federal False Claims Act violations arose when Capital Rail invoiced Metrorail owner, the Metropolitan Washington Airports Authority, which in turn sought disbursement of funds from a Transportation Infrastructure Finance and Innovation Act loan, administered by the U.S. Department of Transportation.